There are two great ways to attach fabric without sewing: fabric glue or a fusible bonding tape like Dritz Stitch Witchery. If you have a sewing machine, sewing is often still the fastest and most reliable method for many projects, but fabric glue or Stitch Witchery are great alternatives. They are also used when you don’t want stitches to show, like on curtain hems. 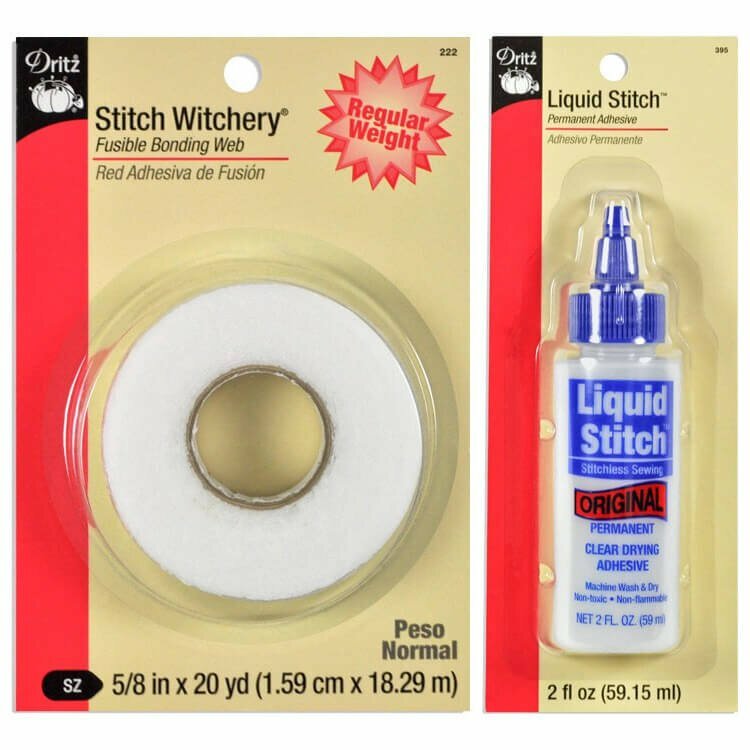 See our video on How to Use Dritz Stitch Witchery for detailed instructions. It’s best to test either method on a scrap of fabric before using. Fusible bonding tape is a strip of adhesive that melts when ironed to adhere fabric together. This is a simple way to create a permanent bond that isn’t at all messy and doesn’t require drying time. It’s perfect for cotton and other fabrics that can withstand medium to high heat. It helps to use the steam setting on your iron to create the best bond. Dritz Stitch Witchery comes in various widths and weights and it’s machine washable and can be dry cleaned. Bonding tape is also commonly used for hems instead of top stitching so no stitches will be visible. Fabric glue like Dritz Unique Stitch and Dritz Liquid Stitch are fabric glues that also provide a permanent bond. If your fabric doesn’t hold up to heat well or if you don’t have an iron, this fabric glue is the best no-sew option. These glues are clear and washable when dry. Do you think glue would be strong enough to hold an LED light strip attached to side of jeans? only needs to last one night. BEST ANSWER: The glue would stick to the fabric fine, but I can't say how well it would stick the the light strip. Does glue work well for large projects like reupholstering patio furniture? BEST ANSWER: While you could probably do it with glue, for best durability, sewing is better. It would also take a long time to do because there would be a lot of waiting for the glue to dry! I'm 74, no longer able to sew. I want to make hospital gowns so I don't have to wear the ill-fitting, scrappy gown they give you in hospital. Do you think it might be possible to glue such a garment? BEST ANSWER: Possibly, though it may be time consuming and tedious waiting for the glue to dry. Can I use stitch Witcher’s on nylon? BEST ANSWER: I believe the temperature needed to melt the Stitch Witchery will also melt the nylon, unfortunately! How do you remove bonding tape from a garmet? BEST ANSWER: You can heat it back up again with an iron to melt it. You may be able to scrape most of the residue off, but you may not be able to get all of it off. There are several tiny holes at the edge of a down comforter. I would like to fuse binding tape down the whole edge. Is it feasible to do this with StitchWitchery fusible bonding tape (without sewing)? BEST ANSWER: Yes, this should work!